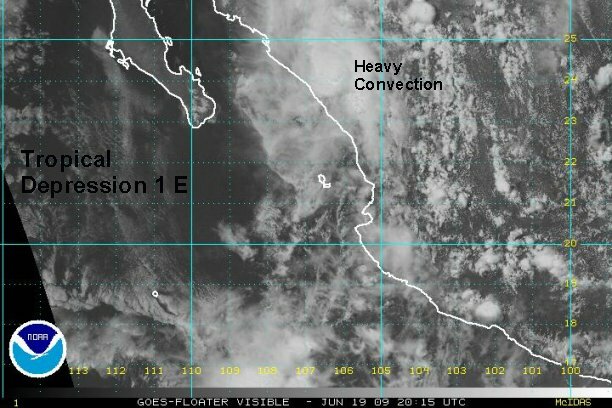 Satellite imagery confirms a weak circulation on the border of becoming a tropical depression centered near 14. 5° N / 105.5° W or about 325 miles south of Manzanillo. There is an impressive tap of tropical moisture to the southeast side which could get drawn into the system. NHC pulled the trigger earlier today with a high chance of development. We will also upgrade to high chance if the surface low can build a bit more under the convection. 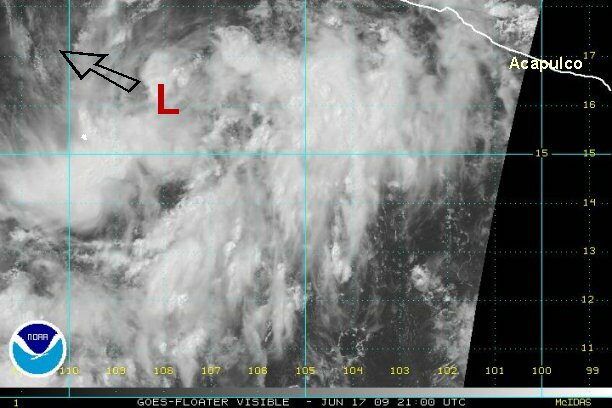 Right now the low is moving west northwest well away from the Mexican coast. Visible satellite shows a surface low, apparently on the northwest side of the deep convection. Another mid level low seems to be displaced about 50 miles southwest of the surface low. The visible satellite imagery from the past few hours show that the low level circulation in now exposed. Upper air easterlies have pushed the convection farther west. We will hold with our moderate chance of development. If the low continues to be exposed, we'll downgrade tomorrow morning. After looking rather disorganized overnight, the convection is now again in a bursting phase. It appears that the surface low is under the convection again. We left our develpment chance at moderate, but will upgrade to high if there is persistence with the convection for another six hours. The center of circulation is approximately 300 miles southwest of manzanillo and is paralleling the coast, moving west northwest. A burst of deep convection started on the southwest side of the circulation, but now has built over the center. A deep pool of tropical moisture is nearby to tap for development. The weak surface low appears to be gathering a little more convection near the center of circulation. It is probably close to tropical depression status. Even though the system is slowly trekking toward cooler ocean water, there may be enough time for it to undergo some development. It is currently centered about 320 miles southwest of Manzanillo and continues to move west northwest, essentially paralleling the west coast of Mexico well offshore. The overall circualtion is close enough that some showers and storms are near the coast of Manzanillo. Visible satellite imagery shows a slow organization today. Deep convection is still available on the south side of the circulation. The latest satellite imagery shows that the tropical disturbance has now become a tropical depression. Deep convection has covered the surface and continues to grow. Winds aloft are favorable for continued development. 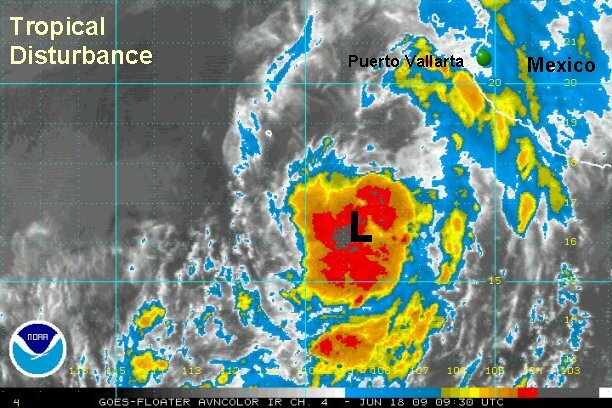 Re: Tropical depression southwest of Puerto Vallarta?? Officially this system is a tropical disturbance. In reality, it is a tropical depression. As mentioned as of the late evening update last night, it appears that the system has organized enough to be classified. We expect that NHC will start advisories later this morning. Earlier Quickscat showed a very sharp trough, so we think that a surface low is actually present at this time with favorable winds aloft for some development. The motion appears to have slowed down a bit from last night. Yesterday, it was moving west northwest, then northwest. Water vapor imagery shows a deep trough to the west of Cabo. This trough will likely turn the disturbance northward today and at the same time start some shearing a little later. That would take the system east of Cabo north of Puerto Vallarta. Right now, the only effects are scattered showers on the coast. I.R. satellite imagery shows a burst of very deep convection over the center of the surface low. 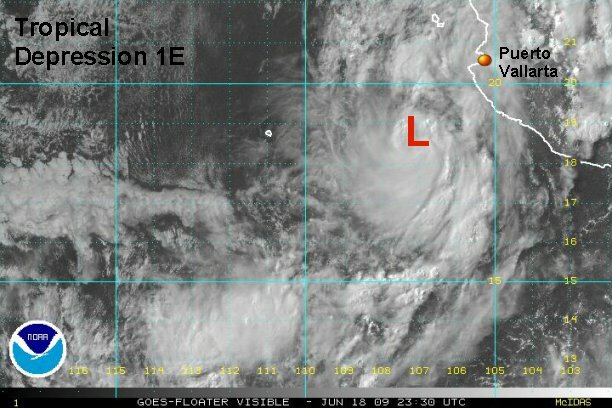 Tropical depression 1 E is centered near 17.7 N / 108.4 W or 400 miles south southwest of Mazatlan, Mexico. Top sustained winds are 30 mph. NHC is issuing its first advisory as of 11 am pdt. It looks like the Hurricane Center and our previous forecast from this morning are right in line. They bring the tropical system inland east of Cabo and north of Puerto Vallarta. The upper trough has turned the tropical depression and it is now moving north and will curve to north-northeast in the next 12-24 hours. Some rain bands are already approaching the coast near Puerto Vallarta southward to Manzanillo. The motion should bring this system inland near Mazatlan in about 24-36 hours. The main threat at this time will be squalls from the rain bands. There is enough time for this to become a tropical storm before landfall (top sustained winds of at least 39 mph). NHC's estimate of 30 mph now looks like a good estimate. Satellite imagery shows rain squall bands extending east toward the west coast of Mexico. Deep convection is near the surface center, but mainly displaced a little to the southwest of the circulation. 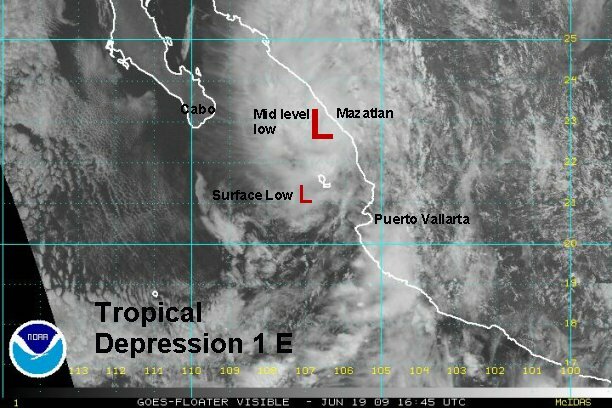 Tropical depression 1 E is centered near 18.4 N / 107.3 W or about 335 miles south southwest of Mazatlan, Mexico. Top sustained winds are 35 mph. The tropical depression is moving north northeast at about 11 mph. The water vapor shows the deep upper trough west of the Baja. This trough is guiding the tropical depression toward land and it should make landfall by Saturday morning. So it has about 24-36 hours still over water. The wind shear increases dramatically just north of the tropical depression. We think that there is enough time for it to become a minimal tropical storm (andres) before making landfall or before shear tears it apart. The biggest impact is still going to be squalls of heavy rain. At this time winds do not seem to be a big concern, although some gusts could be near 50 mph if it strengthens to a miinimal tropical storm. Visible satellite imagery from today continues to show organization. Deep convection is wrapping around the center of circulation. A few rain bands have made their way inland over Cabo Corrientes. Tropical depression 1 E now a tropical storm? 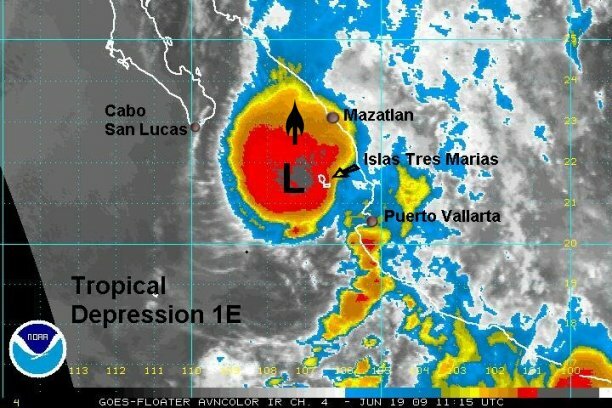 Tropical depression 1 E is centered near 135 miles south southwest of Mazatlan, Mexico. Officially top sustained winds are 35 mph. The tropical depression is moving north at about 12 mph. Our estimates of motion are slightly different than NHC's 5 am edt advisory. It appears that the tropical system is moving more north than north northeast at this time. The low is speeding up and appears to be passing Islas Tres Marias to the west. 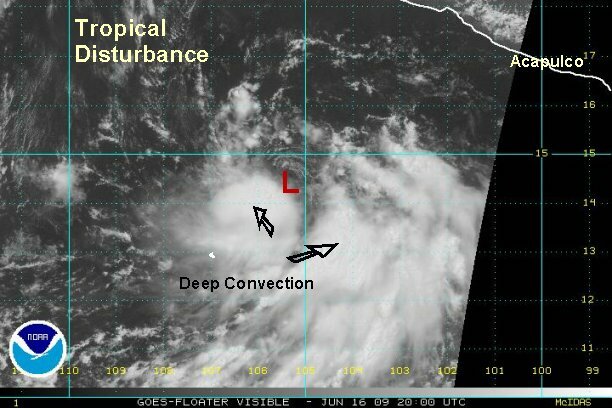 This is a deviation from NHC. Their track takes it over the islands this afternoon. We think that it may already be very close to the islands and passing just west of them. If this is the case landfall may occcur earlier than the 5 pm Saturday landfall. We will also be watching the first visible pictures closely. It's possible that the upper air winds are pushing the deep convection north of the actual surface low. It's hard to tell until the first visible satellite pictures are in, or a new Quickscat is seen (unlikely). We also believe that this tropical depression is a tropical storm (barely). The estimate of winds are 40 mph with higher gusts. NHC is likely waiting for the first visible satellite images to upgrade and will likely do so at the 8 am pdt advisory time. With the system moving farther north, landfall may be displaced more northwest of Mazatlan. Any interests near and north of Mazatlan need to finish preparations for a minimal tropical storm soon. A strong burst of the deepest convection so far with this tropical depression near Islas Tres Marias. The low on the satellite image is where strong cyclonic motion is seen. It's possible that this is a mid level circulation displaced north of the surface low because of upper air southerly winds. We'll know when the visible satellite pictures come in. If that is the mid level center, the surface low is still a little farther south. Tropical depression 1 E is being sheared by upper southerly winds. There is now only a very small window - if it hasn't already past of this officially being called a minimal tropical storm. The surface low is southwest of the Islas Tres Marias and the mid level low much farther northeast near the coast. The low is becoming extremely tilted and the convection will probably be totally stripped by this evening from the surface low. This system was probably a minimal tropical storm for a few hours early this morning. The worst weather conditions will be affecting the coast near and north of Mazatlan now through the next six hours. Convection is weakening as the cloud tops warm. The tropical depression has been ripped apart by strong upper southerly winds. Only a small part of the mid level circulation is apparent over land. The surface circulation is non existent. This is our last advisory on this tropical depression. 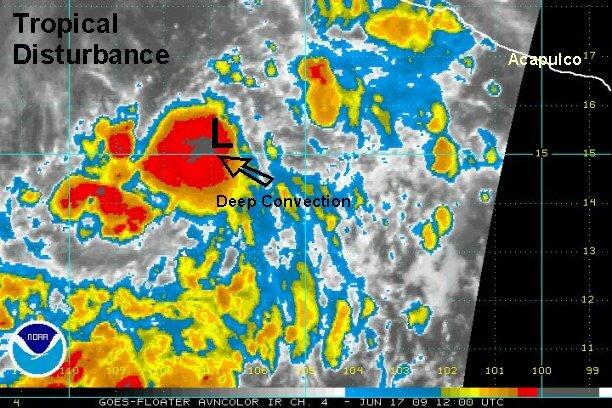 Tropical depression 1 E struggled to gain organization in its early stages of development. A mid level low appeared on satellite imagery, but Quickscat and visible satellite imagery could not confim a surface low. By Friday night changes began to rapidly occur. 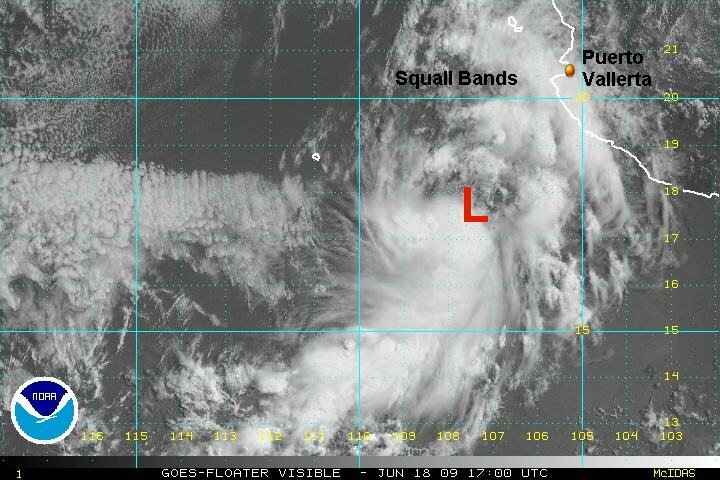 A deep trough of low pressure aloft west of Baja was not only influencing the direction of the tropical depression but now its strength. A large burst of deep convection was not doubt aided in development by a southwestly jet aloft. Ironically, this core of strong winds soon destroyed the depression stripping the low level circulation from the mid levels. It is in question, if there ever was a very organized surface low. The burst of deep convection occured just west of Islas Tres Marias late Friday night and early Saturday morning. Tropical storm conditions may have been experienced for a short while west of the islands. We'll never know for sure. This area is void of data and estimates were mostly obtained by I.R. satellite which can be very tricky. Late Saturday afternoon it was very apparent by visible satellite imagery that the mid level low was stripped away and that this tropical depression was quicly fading away.